Property fund Barwon Investment Partners has acquired a new strata medical centre for $8.2 million in the heart of Cedar Woods’ Williams Landing town centre. The site at 111 Overton Road features 1,520sqm of net lettable ground floor area and is fully leased to Cornerstone Health, a national medical operator. Still under construction, the property is slated for completion in April 2019. CBRE’s specialist healthcare team, Josh Twelftree, Sandro Peluso and Jimmy Tat, negotiated the transaction – continuing a strong run of strata medical sales. “The security associated with the healthcare investment class, coupled with its tightly held nature, means buyers are being increasingly selective between freehold and strata assets,” Mr Twelftree added. Mr Peluso said the Williams Landing precinct was a dynamic commercial and residential hub, already buzzing with activity. “Forecasted growth within the wider city of Wyndham has been well received by investors, who have also been surprised by the significant number of white-collar professionals re-locating to the area,” Mr Peluso added. 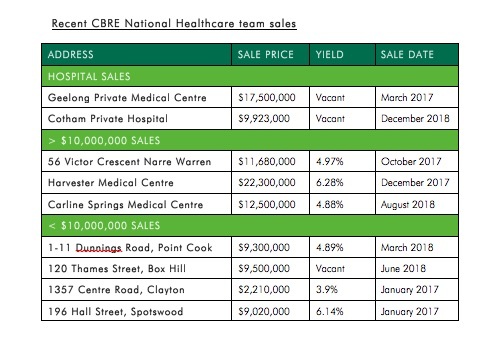 See overleaf for recent CBRE National Healthcare team sales.